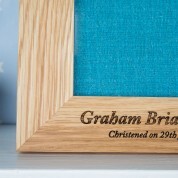 This wooden frame is a thoughtful christening gift for any little baby. 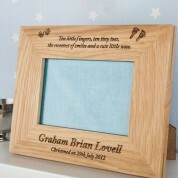 A personalised frame coupled with a christening family photograph will act as a lovely reminder of the special day. 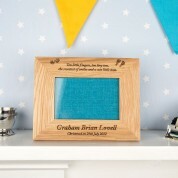 This gift is ideal for mounting on the wall or displayed on a tabletop next to the other family photographs. The baby's parents will want to show off this lovely gift to their friends and other family members. Dimensions: approx 23cm x 18cm x 2cm.